Wit Design is changing the formula for children’s furniture. The Wit Collection ( a chair, table and stool) is unique in its meticulous attention to how kids interact with furniture, combining timeless design with functionality suited for children. The Wit Chair and Stool carefully consider how children move, imagine an play. It is strong and stable enough for their typically rambunctious ways yet portable enough to be picked up and moved around. The stool fits under the Chair for easy storage. The Table, just large enough for any creative project, provides a perfect little place for big imaginations. The Wit Chair has been recognized as one of the best residential furniture products of 2018 by two prestigious Architecture and Design industry organizations, Architizer and The Architect’s Newspaper. The chair was named an Architizer A+ Award Special mention and received an Honourable Mention distinction by The Architect’s Newspaper. Wit is visually appealing to both kids AND their parents, fitting comfortably in any apartment, living room, playroom, family room, or a kid’s bedroom. 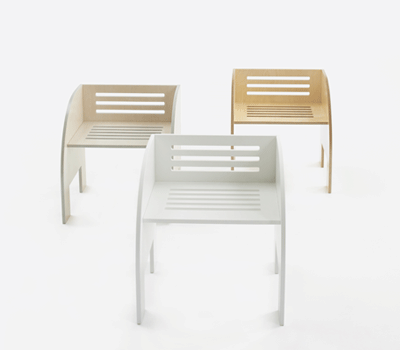 Wit is designed with rounded child friendly edges, concealed connections, made from Baltic birch plywood with non-toxic finishes and respects the natural environment in its production. The furniture’s timeless design and lasting construction allow it to be passed on to others, adding to is true sustainability. The Wit Collection is designed by Architect Katharine Huber, who has worked for award winning international architecture firms. Her work consistently stands out for its attention to scale and sensitivity to humans, or little humans, in the built environment. The Wit collection, designed for children ages two to six, is distinctive for its harmonious interplay of straight lines and curves. It is designed with a graceful simplicity without clichéd childish elements, emphasizing that good and considered design for children helps improve their lives.